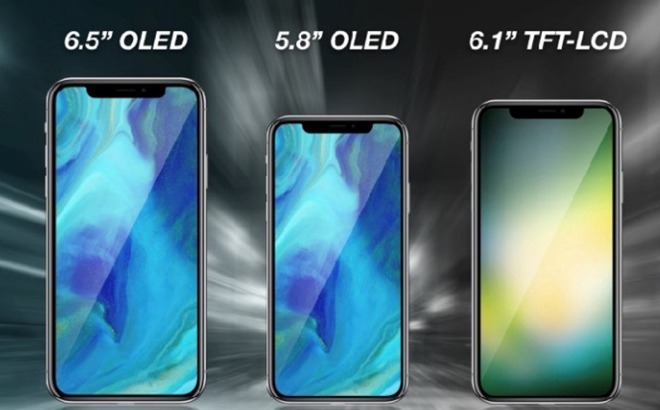 Although it may feel like the iPhone X launched just recently, Samsung is reportedly kickstarting OLED panel production for two of this fall's iPhone models, including a 5.8-inch "iPhone X 2" and a 6.5-inch "iPhone X Plus." Early production should start in May, with capacity doubling the following month, Taiwan's Economic Daily News claimed. The story would appear to back up one published by South Korea's ETNews just last week, which said that Samsung would have to reactivate production for the task after temporary downtime related to iPhone X display inventory. Samsung is Apple's exclusive OLED supplier for the X, as the only company with enough capacity to keep up with Apple's demands. The latter is thought to be talking to other suppliers, but it seems unlikely that any will be able to make a meaningful contribution to 2018 iPhones. Rumors have pointed towards three new iPhone models later this year: the aforementioned "X 2" and "X Plus" phones —unlikely to use those names in practice —and a 6.1-inch LCD model. Unlike the iPhone 8, this year's LCD phone may join the X in ditching a home button and Touch ID, switching to Face ID and an edge-to-edge display. In 2016, Apple reportedly placed an order for more than a year's worth of Samsung OLED panels worth some $4 billion. That may have been as much to secure inventory and good pricing as cope with anticipated demand. Apple is rumored to add two new OLED models to its iPhone lineup this fall including a 5.8-inch iPhone X replacement. The 6.5-inch "iPhone X Plus" was originally expected to have a panel manufactured by LG, but it was suggested when the rumors began that the South Korean firm might not be able to meet Apple's production standards on time. The LCD model should be the cheapest of the three, if still expensive. It may share most of the features of its counterparts, simply sacrificing the superior image quality and power consumption of OLED. All 2018 iPhones are predicted to have logic boards built on substrate-like PCB (SLP) technologies first adopted by iPhone X and iPhone 8. The 5.8- and 6.5-inch OLED iPhone models will likely sport stacked board designs like iPhone X, while the 6.1-inch LCD model will stick to a traditional single-layer layout.